This set of comparisons just about says it all when it comes to the three top selling 8-Bay bowtie designs. There's a good bit of discussion on various forums with unsubstantiated comments like "this one is better than that one", or the observation that "... most 8-Bay antennas are optimized for the old UHF spectrum". The main problem I have with comments like "this one outperforms that one", or "this one is better than that one" is that they always leave me wondering something like "Better? Better in what way? Does that mean better for all channels? What about my particular problem channels; will it be better for me?" The "Fan Dipole", aka "Triangular Dipole", aka "BowTie" antenna is an extremely complex electo-mechanical component, and thus complex to model. The goal of the captures here was to help answer that simple question "Will it be better for me?". The answer, not so surprisingly, turns out to be dependent on where your biggest problem is (in the spectrum). How do they rank? 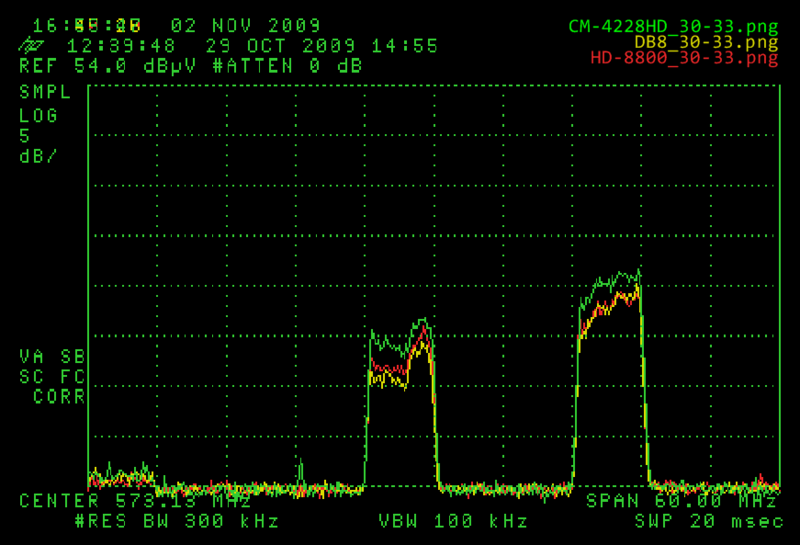 Over the majority of the UHF band the Channel Master appears to be the better performer. 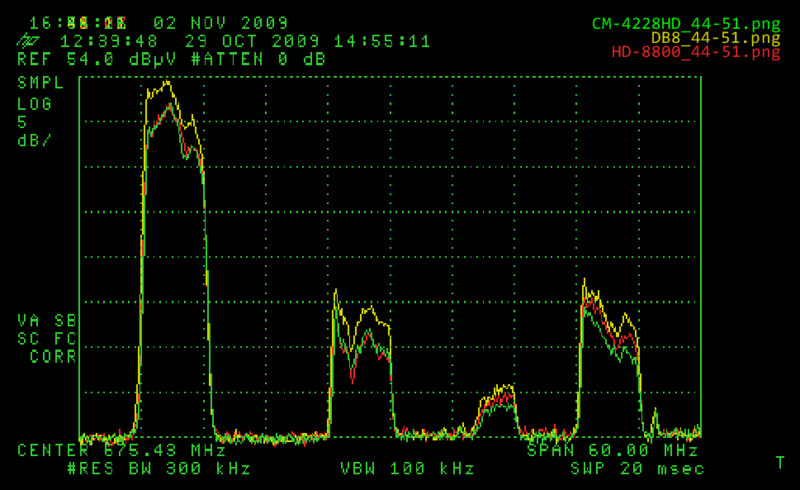 The caveat is that above (about) Ch 40, the Antennas Direct DB8 excels. 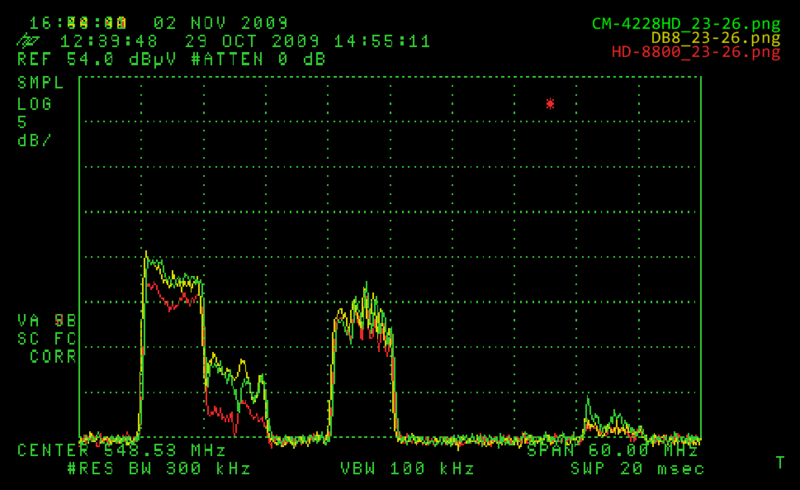 Also, because the DB8 exhibits a slightly stronger signal over most of the band below Ch 40 than the Winegard HD-8800, the DB8 appears to rank second, the HD-8800 third. The Winegard HD-8800 was a little bit of a surprising disappointment, especially for such a long standing company which has produced so many other quality products. In addition to demonstrating a generally lower gain, it has a few physical short comings. It was the most tedious to assemble because it has the most nuts & bolts to install of all three; most of these to hold the joining booms together. Some screws were also a little hard to reach, lying in between the active and reflector elements. Finally, the locking design of the "snap into position" active elements does not always yield a strong lock. Some elements required very little pressure to push them out of position. The top most element of the test unit could be pushed downward with a fairly light touch of the finger. Repeated use as a bird perch would easily displace the element, resulting in loss of gain. On the other hand, along with its overall favorable performance, the Channel Master was hands down the easiest to assemble. It ships in an over size but fairly flat box, with all bays already ganged, and the active element boom assembly pulls easily into position in front of the reflector. The DB8 assembly comes out closer to the Channel Master than the Winegard. Not quite as simple as the Channel Master, but it moved along quickly, and was no where near as tedious as the Winegard. Of the three, the reflector design of the Channel Master uses the closest reflector spacing, and thus a higher number of reflectors for the same overall area. This higher density of reflectors, along with a longer overall dipole dimension, is a likely contributor to its higher low end gain (see the sidebar below for more discussion on this). It might be interesting to revisit those comments like "... most 8-Bay antennas are optimized for the old UHF spectrum". Here are the mechanicals for the three units tested here. The "old" DB8 is just included for reference. Do the measurement observations correlate with this mechanical data? Hmmmm.... not exactly. If the longer length dipole is such a critical factor, wouldn't both the CM4228HD and WineGard HD8800 outperform the DB8? The implication is that dipole length may not be the only significant factor. 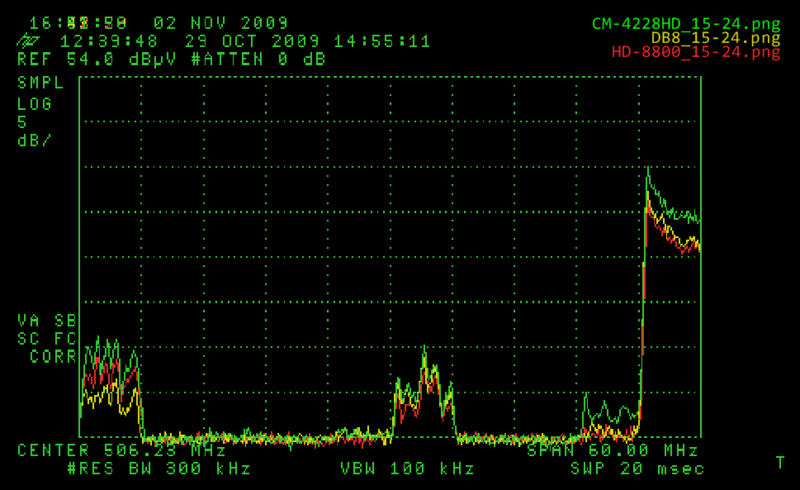 By observing the characteristic resonance frequencies for the lengths involved, its pretty clear the "new" UHF spectrum is just as much within the range of the "old" designs as it has always been. Its also clear that for some channels these bowtie designs behave like a 1/2 wave antenna, and for other channels they behave like a full wave antenna. What electrical characteristic changes the most across this range? Impedance. How in the world can one optimize the power transfer from an electrical source whose impedance varies so dramatically across the spectrum of interest? The answer is simply that you can't optimize for all frequencies; its only possible to find a compromise. That is, a "best choice" center frequency at which source and load impedances are matched optimally, and above and below which things don't get so bad as to be unusable at the extremes of the spectrum. The design choices that have gone into the transmission systems and baluns of the various models must surely represent a compromise aimed at centering optimal performance within the desired band. If the center point of that band has shifted (as a result of the re-allocation of the high end), then the only thing that should need to be shifted is the center point targeted by the balun. So the suggestion is that while designs like the DB8 do have shorter dipoles, their lengths are not out of the band of interest, and by slight modification to their integral baluns, it might be possible for them to peform comparably to longer dipole designs at the low end.